“The main problem with searching for mouthpieces is finding happiness in one of them, but the truth is in JodyJazz mouthpieces. I personally can say that the first time I played a JodyJazz mouthpiece I could feel a big difference in sound, comfort to play, presence, strength and stability in all registers throughout the instrument and that is without forgetting the amazing construction, elegance and beauty that the mouthpiece has. I play the JodyJazz Super Jet 8. The comfort and power is awesome. I can be playing any kind of music and it’s the same. JodyJazz mouthpieces are totally the best choice for every saxophone player. Once you try it, you’ll fall in love. Other points that are very important: each mouthpiece is made with the dream of bringing happiness to all those who join and enjoy this great and incredible mouthpiece. I tell you this from my own experience!! Thanks to JodyJazz for the opportunity to be a part of this Great Family!! “Bueno … El principal problema con la boquilla es encontrar la felicidad en uno de ellos, pero la verdad está en JodyJazz Boquilla. Yo personalmente puedo decir que la primera vez que toqué una boquilla de JodyJazz pude sentir la gran diferencia “Sonido, comodidad de jugar, presencia, fuerza y ​​estabilidad en todos los registros sobre el instrumento, eso sin olvidar la increíble construcción, elegancia y belleza Boquilla tiene “. Juego JodyJazz Super Jet y la comodidad y el poder es impresionante. Puedo estar tocando cualquier tipo de música y es lo mismo, termino diciendo “ la Boquilla JodyJazz es totalmente la mejor opción que cada saxofonista. Una vez que lo intentes, te enamoras. Otros puntos muy importantes: Cada boquilla está hecha con el sueño de llevar la felicidad a todos aquellos que se unen y disfruten de esta gran e increíble boquilla. Te diré esto por tu propia experiencia !! ¡Gracias a JodyJazz por la oportunidad de pertenecer a esta Gran Familia !! Born in Dominican Republic, at the age of 6 years old Rafael begging his journal as a music student at Bellas Artes studying Flute and Clarinet. 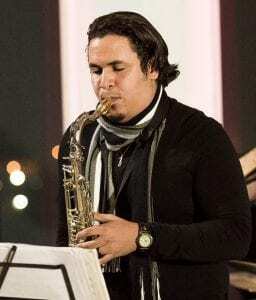 By the age of 15 years he started his Saxophone studies at Ica (DR) where He graduated with a Middle Level diploma. After being working those years with many artist in his country he got a scholarship to study in the prestige Berklee College of Music and He decided to move to EEUU to continue his music education. Nowadays Rafael is coursing a Bachelor Degree in Contemporary Writing and Production and Performance majors. Rafael Suncar plays Alto, Tenor & Soprano Saxophones, Electronic Wind Instrument (EWI) and synthesizer. He is considered today among the most talented saxophonists of his generation in the fields of Jazz, Pop and World Music. He is currently working on his first album which will be going out this year with the best of this artist through the language that connects us: ‘’Music’’. Rafael says thanks to God always, All I am is for Him.